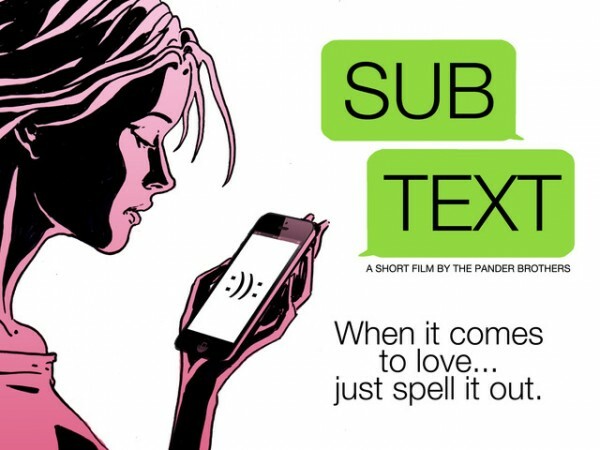 From award winning filmmakers, the Pander Brothers, comes a brand new short film, “SUBTEXT”, which explores modern relationships in the era of text messaging. Funding for the project was raised through Kickstarter. The Pander Bros. are excited to work in this new fund raising format, giving them a chance to work with long time community friends and supporters. The Dandy Warhols frontman Courtney Taylor-Taylor, is Executive Producing “SUBTEXT’, which begins shooting in July. Taylor-Taylor supplied the song “And Then I Dreamt of Yes” for the Pander Brothers’ celebrated 2010 debut feature film, “SELFLESS’. Since then, the brothers have spent time between Portland and Los Angeles directing commercials for brands like Panasonic, LG and adidas Originals while developing a handful of their graphic novels as cross – media with video and music including the web series, “Tasty Bullet Exposed” based on their Energy Drink conspiracy graphic novel Tasty Bullet co-authored by Jonathan Vankin for Image Comics. The Pander Bros. are well known for their work in graphic novels. They recently launched a new website, www.panderbroscomics.com, offering their various creator owned comics digitally. The Brothers share their love of the graphic storytelling medium with rocker Taylor-Taylor who recently released his first Graphic Novel, One Model Nation on Titan Books.